As Turn 1 began, the Space Monster moved to Cargo Hold One and successfully damaged it. The Captain moved to the Computer Room and Science Officer Cinder moved to the Infirmary. Cinder then discovered that the monster had a chameleon ability (One of the Monster Attributes). The Monster then emitted an EMP (another Monster attribute) which shut down all of the lights, monitors and the ship’s computer for the rest of the turn. Alarmed by this, the Crew decided to attempt to fix the ship and began moving to the damaged sections. The monster appeared in Corridor Two and attacked Second Officer Palance. Palance wounded the monster on the first combat roll, but was killed when the monster emitted a sonic screech (the third and final attribute of this monster). Both player decks would expand to 40 cards during the end phase. Turn 2 started with the Crew arming themselves with guns. Next, they discovered that the Monster was using the vents to move around the ship. They quickly decided to hunt down and kill the monster immediately. The Monster avoided detection and managed to heal its wound. The Crew finally located the monster and attacked. During the melee, Britt was wounded and the Monster managed to get away. At the beginning of turn 3, Navigator Hamm and Executive Officer Abel moved to the Bridge and began plotting the ship’s exact position. This would take the entire turn. The rest of the Crew headed towards the damaged sections. The Monster now attempted to evolve, but was unsuccessful. Cinder and SISTER turned up something useful to use against the Monster, resulting in the Monster losing a card from next turn’s hand. The Engine room suddenly lost pressure, making it uninhabitable for the rest of the turn. The Crew finished out the turn by quickly constructing a couple of electrical prods to combat the monster. Turn 4 began with a bang as the cargo in both holds exploded. The Crew headed to the damaged sections to attempt repairs. Just then, the Captain and Science Officer Cinder moved to the Infirmary to look at something interesting. They would be forced to spend the rest of the turn there. The rest of the crew reached the damaged areas and managed to repair the damage in Cargo Hold One. New damage was detected in the Crew Mess. The Crew responded by splitting up again. The Monster appeared in the Cargo Hold Two and wounded Chief Engineer Milton before he was able to escape. The Monster again emitted an EMP, shutting down the ship’s system’s for the turn. During the End Phase, the Monster evolved to Stage One. Turn 5 started with the Monster quickly evolving to Stage Two. To negate the monster’s sonic screech attack, three of the surviving Crew members put on EVA suits. New damage was detected in Corridor One. The Crew decided that in order to better fight the monster they would split into two teams. But this idea was immediately negated when they started bickering and fighting and not trusting each other. New damage was detected in the Escape Pod. The Crew was able to repair the damage in Corridor One. At the beginning of Turn 6, the Crew moved to the Bridge and held a burial in Space for Palance. This forced the Crew player to randomly discard a card from his hand. The monster became distracted by the lights on a control panel and had to randomly discard a card. The Captain came up with a plan to deal with the situation and the Crew went into action. The Captain then attempted to activate the SISTER computer to gain an extra card for next turn’s hand. But SISTER was unable to elaborate. The monster attacked and killed Science Officer Cinder in the Crew mess. 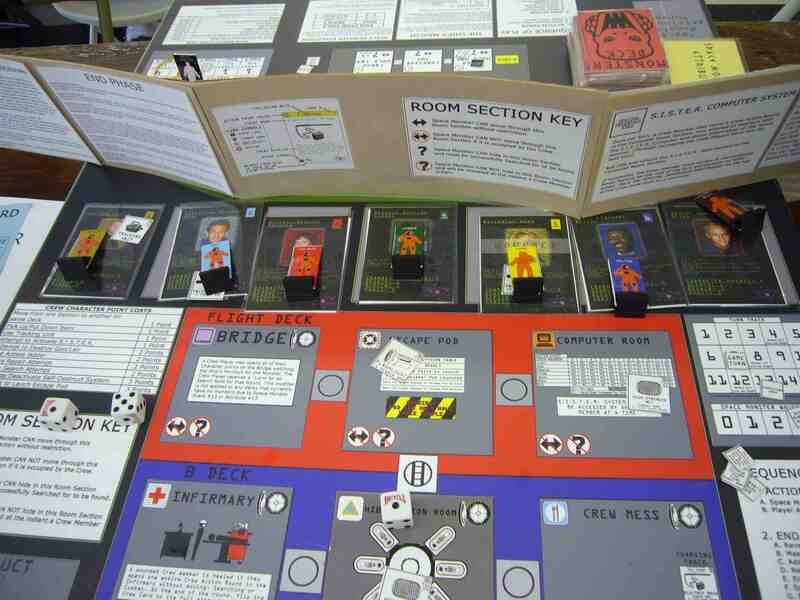 Turn 7 began with the five surviving Crew members suddenly developing suspended animation sickness, resulting in all of their Crew cards being flipped to the wounded side for this turn. First aid was applied to Milton and Britt, so they would be back to full strength once the animation sickness wore off at the end of turn. The monster attempted to damage the ship while the Crew succeeded in repairing the damage in Cargo Hold Two. Knowing that the monster was going to become more powerful as the game progressed, the Crew constructed two incinerators to help fight it. In Turn 8, machines repaired the damage in the Escape Pod. But just as that was taken care of, new damage was detected on the Bridge. The Crew spent the rest of the turn attempting to repair the damage, and one of the incinerators ran out of fuel and was removed from play. The Monster evolved to Stage Three at the end of turn. Turn 9 began with Milton and Britt refusing to work unless they got some more money. The Captain went into the vents to try to force the monster out of the ship. His attempt failed, and he was killed at the third junction. Hamm was told to go take care of something by herself in Corridor One. The Monster appeared out of the shadows there and killed the hapless navigator. Now only three crew members were left alive. Turn 10 started with Milton and Britt again refusing to work. Machines repaired the damage to the Bridge. The Monster attacked again and killed Engineer Milton. The two survivors, Abel and Britt, quickly moved to the Bridge to plot their next move. Turn 11 began with action as the Monster managed to get into the Bridge undetected and kill Britt in the ensuing battle. Abel, armed with both pistols, managed to inflict three wounds and drive off the monster. But the respite was only temporary as the Monster again attacked. Abel’s aim was true, and he killed the Monster. 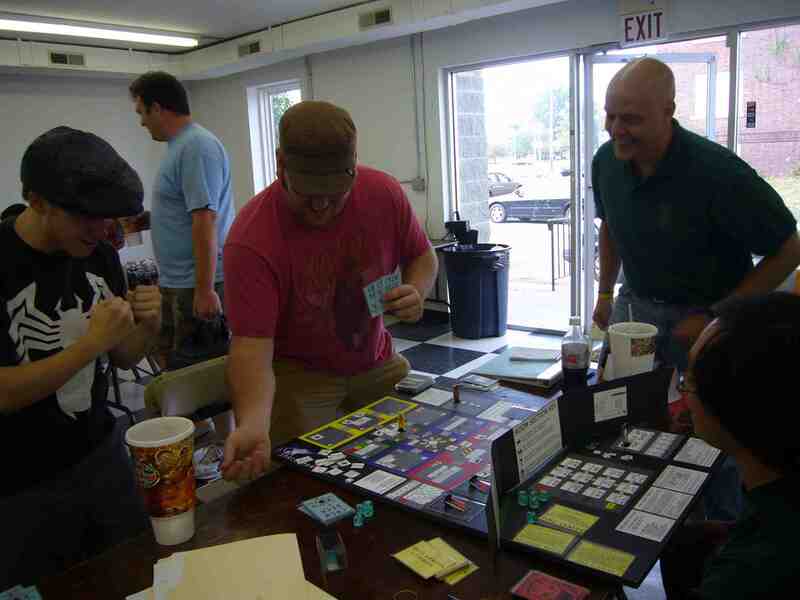 The game had ended in a Minor Crew Victory. Another exciting game, this one ending with the Crew winning! We got to see the Sonic Screech and the EMP attributes used together. They could be a deadly combination. The EMP will have to be tweaked. One suggestion by the players was to have a recharge roll during the end phase to see if the EMP is available again after it has been fired. I like that idea, and will put it into play for the next batch of playtesting. I was glad to see the Crew win a game, but they still need help to give them more of a shot! 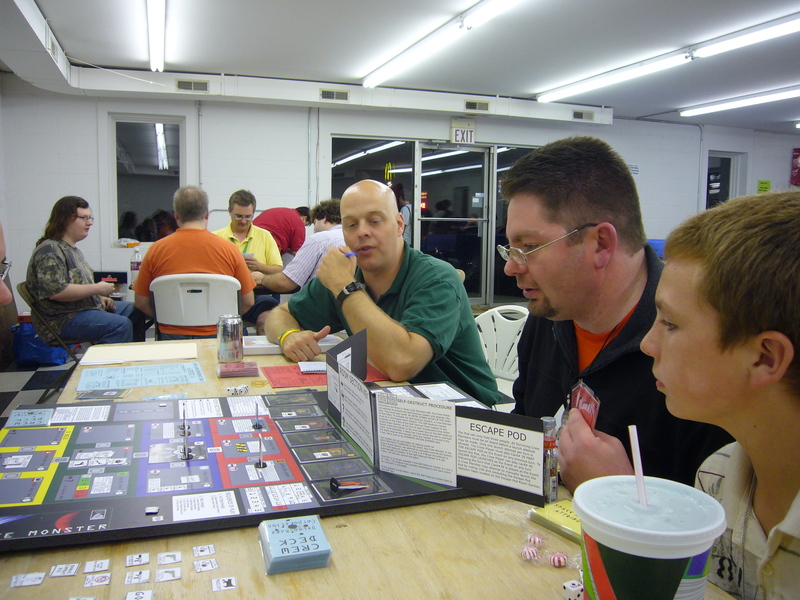 The Space Monster Player (Derek Hurley) chooses the Space Monster Attributes while The Crew player (Matt Aper) looks on. Turn 1 saw the crew move to normal duty stations and then decide to build motion tracking units to help in finding the monster. The monster moved about the ship and unsuccessfully attempted to damage it. Cargo hold Two was repaired by machine. The Monster revealed one of its attributes by emitting an electromagnetic pulse (EMP) which shut down the electronics of the ship for the turn. 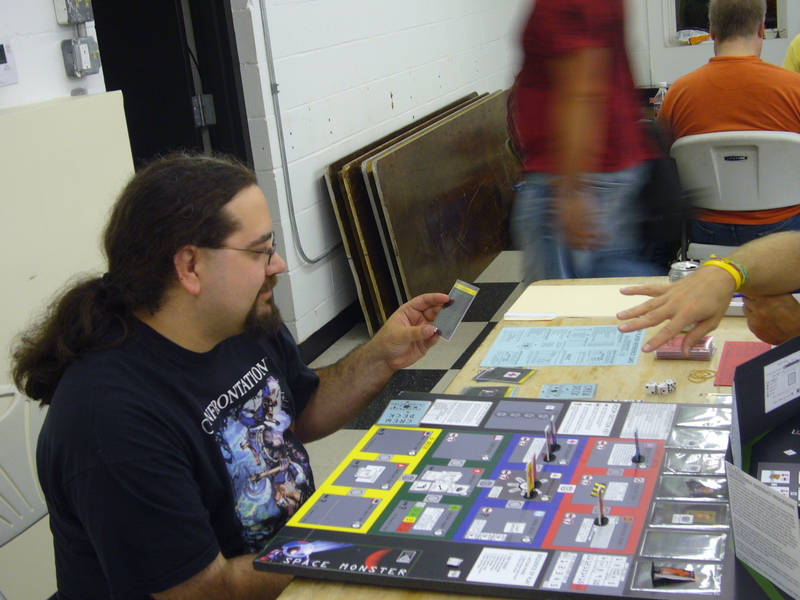 Turn 2 began with Milton and Britt refusing to work unless they got more money. 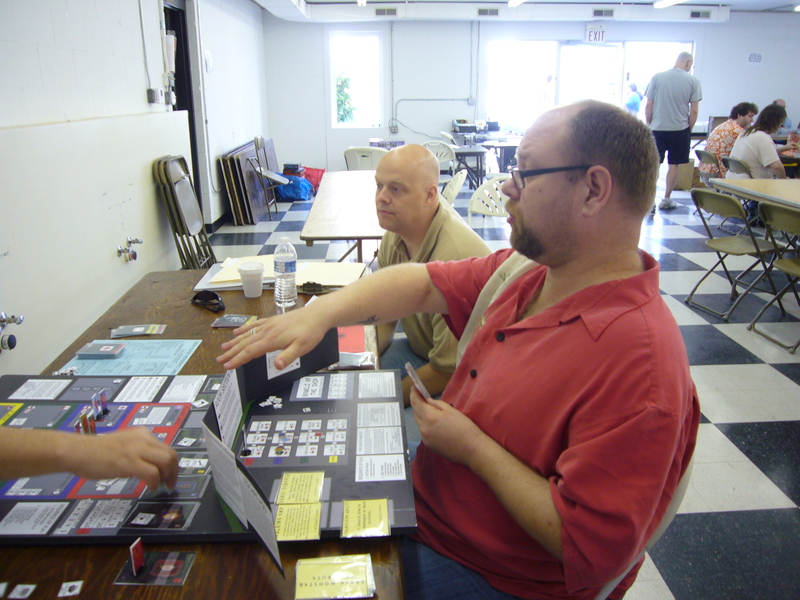 The Captain successfully activated SISTER, resulting in an extra card draw combat at the end of the turn. The Monster attacked Milton in the Engine Room, but only succeeded in wounding him before he was able to run away. This convinced the Crew that weapons would be needed to fight the monster, so high strength nets were hastily constructed. New damage was detected in the Crew Mess, and then both Cargo holds exploded with light damage in both being the result. The Crew began to move to the damaged section. The Monster appeared in Corridor Two and killed Cinder. Despite this loss, the crew, was able to repair the damage in Cargo hold one. New damage was detected in the Crew Mess. The Captain moved to the computer room and again activated SISTER.. The information he received would provide an extra die in any upcoming combat. The monster finished the turn by attempting to evolve, but was unsuccessful. The crew finished out the turn by repairing the damaged Crew Mess. The end of this turn would see the player decks expand to 40 cards. Turn 4 had the Captain spend the entire turn in the Infirmary to study something interesting. The rest of the crew searched for the monster, found it in the Crew Mess, and in the ensuing melee was able to wound it. The Space Monster retreated into the bowels of the ship. The Crew spent the rest of the turn fruitlessly searching for the wounded beast. The Monster started turn 5 healing one wound while the Crew attempted to locate it. The Monster surprised Engineer Milton in the Engine room and killed him. The Crew then decided to split into two teams to maximize their efforts. The Monster, despite this, was able to avoid detection. At the end of the turn, Palance and Britt located the monster and attacked, and although they succeeded in wounding the monster, both were killed in the battle. Now there were only 3 crew members left, so abandoning the ship became a viable solution. Turn 6 began with the Engine room suddenly losing pressure. The monster became distracted by the lights on a control panel and had to randomly discard a card. The surviving crew members argued over who was in command, resulting in the random discard of a card from their hand, also. After calming down, the crew constructed 2 high strength nets. The Captain then decided to try to force the monster out of the ship by going into the vents. His attempt failed and he was killed at the third junction. 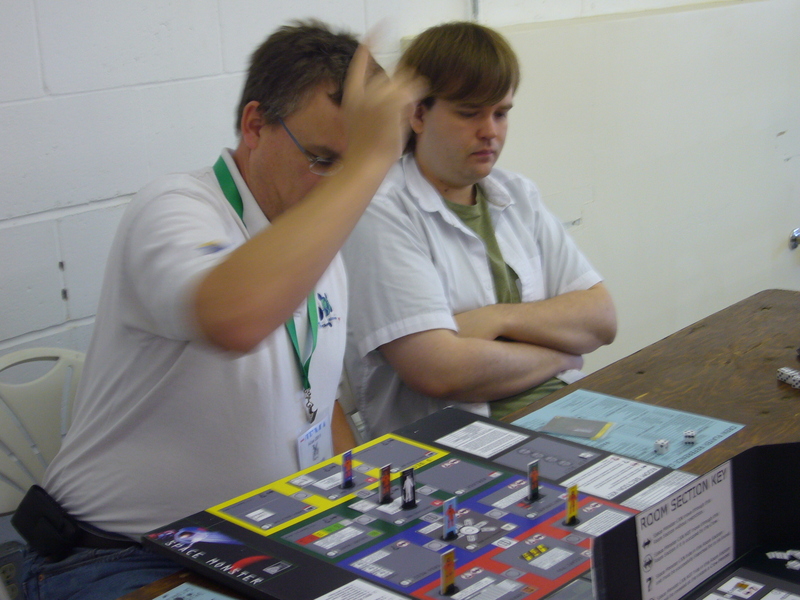 Turn 7 began with action as the monster attacked the two remaining crew members, seemingly from out of the shadows. Hamm was wounded in this attack, but Abel succeeded in driving the monster off in the second round of combat, inflicting another wound. Abel then went to the computer room and asked SISTER for advice, gaining an extra die in combat at the end of the turn. The Monster evolved to stage three in the end phase. In turn 8, Hamm became suspicious of Abel’s motives and didn’t trust him. Despite this rift, both survivors decided to kill the monster, rather than abandon the ship. The Monster, with only two wounds left, did not attack the crew, instead attempting to damage the Infirmary…but was unsuccessful. Turn 9 saw Hamm discovering a secret corporate directive in the ship’s records indicating that one of the Crew was secretly put on board to protect the monster. Abel and Hamm then built incinerators and searched for the monster but were unsuccessful. The monster again tried to damage the ship but was unsuccessful. Turn 10 opened with Hamm discovering that not only was Abel placed on board to protect the monster, but that he’s also a robot! Hamm decided to make a last stand in the hibernation room. 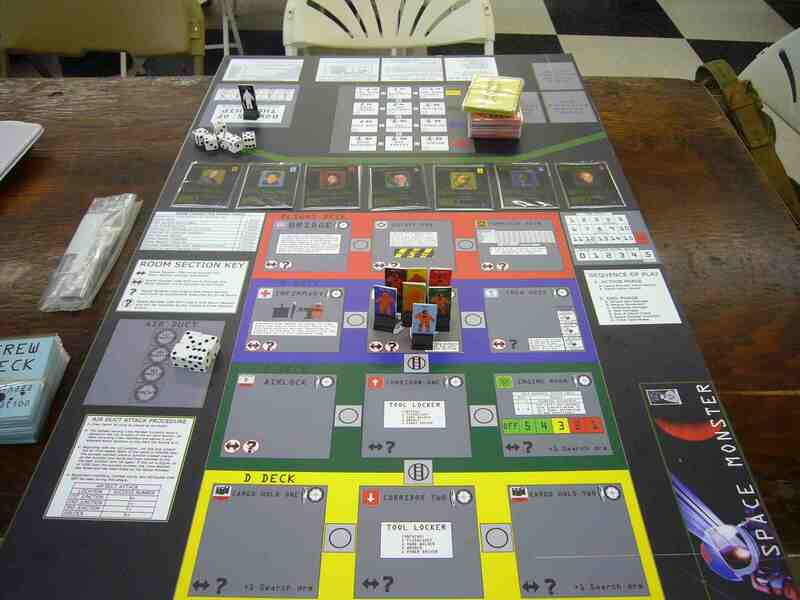 The Robot then attacked Hamm and killed her with an incinerator, ending the game in a major Space Monster Victory. We finally got to see the robot show up! The mechanic seemed to work, but it’s hard to know for sure with only one appearance. The Monster is still too hard to locate – searching will have to adjusted. Another Airduct attack almost wins the game for the Crew. The EMP attribute will have to be better defined. As it stands now, it effectively removes the SISTER bonus card draw. Another fun and exciting game, with both players getting a chance to win the game. And we got to see the robot – armed with a flamethrower, no less. 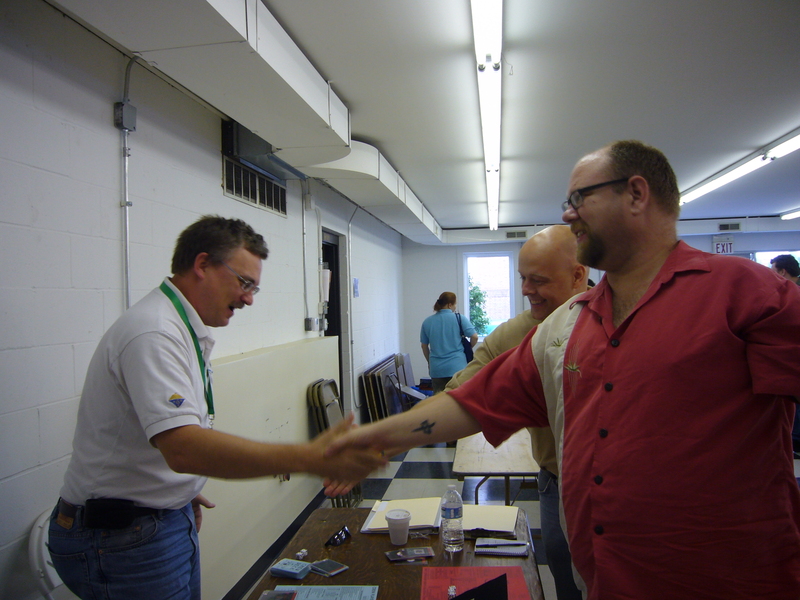 We spent a very enjoyable weekend at ICON in Springfield, IL. 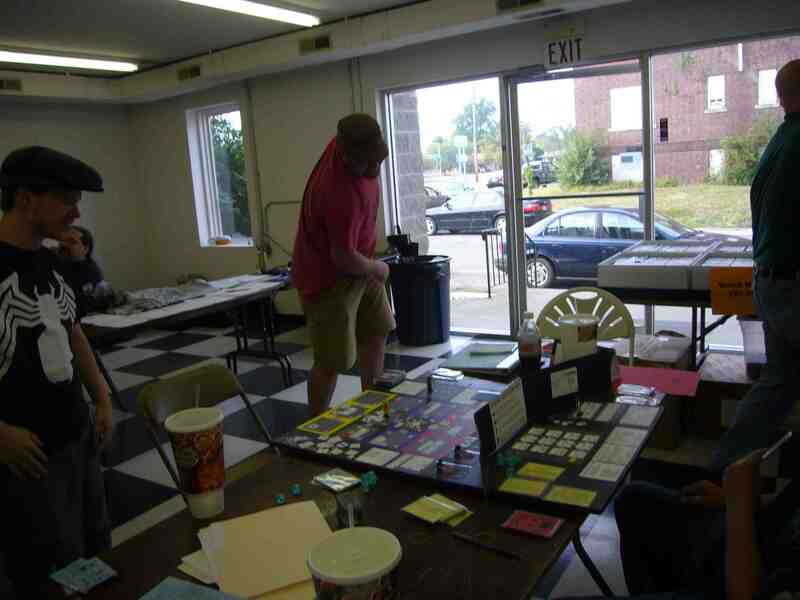 Got to meet a lot of cool folks, make a few new friends, and get in 5 playtest games of SPACE MONSTER. New Damage was detected in Corridor One and the Crew Mess, some of which was quickly repaired by machine. The Crew decided they had to repair the rest of the damage and moved to Cargo Hold Two and succeeded in their efforts. The Monster then began secreting goo (one of the Monster Attributes) while the Crew constructed the high strength nets to finish out the turn. Turn two began with the Monster unsuccessfully attempting to damage the ship and the Crew constructing the electrical prods. The Corridor One Section doors suddenly became jammed trapping Milton and Britt inside. Palance moved to the Computer room and successfully activated SISTER to gain a bonus card for next turn. Milton and Britt, trapped in Corridor One, announced that they weren’t gonna work anymore until they got more money. The rest of the Crew spent the rest of turn fruitlessly searching for the Monster. The Cargo in Cargo Hold 1 and 2 exploded, nearly killing Cinder to start Turn three with a bang. Automated repair quickly repaired one of the holds. The Crew then decided that the damage was too severe to repair in Space. The turn ended with the Crew still unable to locate the elusive Monster. During the end phase the Monster evolved to Stage One due to a Monster Attribute. Turn Four began with the Space Monster quickly evolving to Stage Two, an ominous sign for the Crew. The Crew again continued their efforts to find the monster and Palance again activated SISTER to earn the extra card. The mascot got loose and the Captain and Cinder went to the Infirmary to discuss an interesting discovery. This discovery led to the Crew learning about the Space Monster’s ability to evolve more quickly. Cinder and Hamm spent the entire fifth turn on the bridge to plot the ship’s current position. New damage was detected in multiple sections. The turn ended with Milton being killed by a surprisingly large and powerful creature. With the first crew player killed, the player decks would expand to 40 cards at the the end of this turn. The Monster appeared out of the shadows and killed Palance and Britt in quick succession. The Crew, finally becoming aware of the seriousness of the situation, opened the weapons locker and armed themselves. The Monster attacked the Captain but was fought off when the Captain overloaded his electrical prod and wounded the monster. The four remaining crew members located the monster and attacked it. The Captain was killed in the attack. The Space Monster healed its wound, making the Crew’s chances even worse. The end of the turn saw the Monster evolving to stage three. 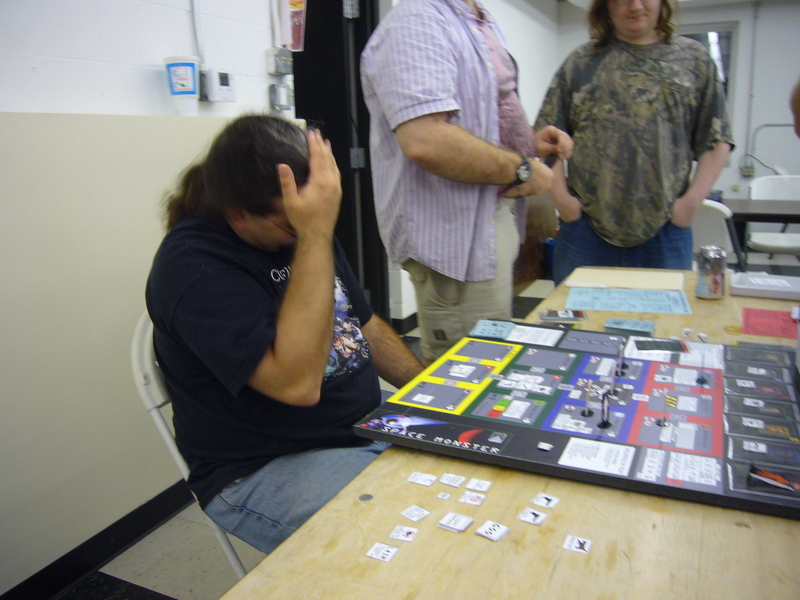 The Monster evolved to stage four but was quickly distracted by the flashing lights of a control panel and was unable to attack anyone this turn. Abel was killed in a savage attack from the now fully mature monster. Cinder and Hamm, realizing that their chances of surviving were slim, decided to attempt to force the monster out the airlock. Cinder almost succeeded, falling short on the final roll and dying in the air ducts. Turn ten began with Hamm, all alone, deciding to make a last stand in Corridor One. 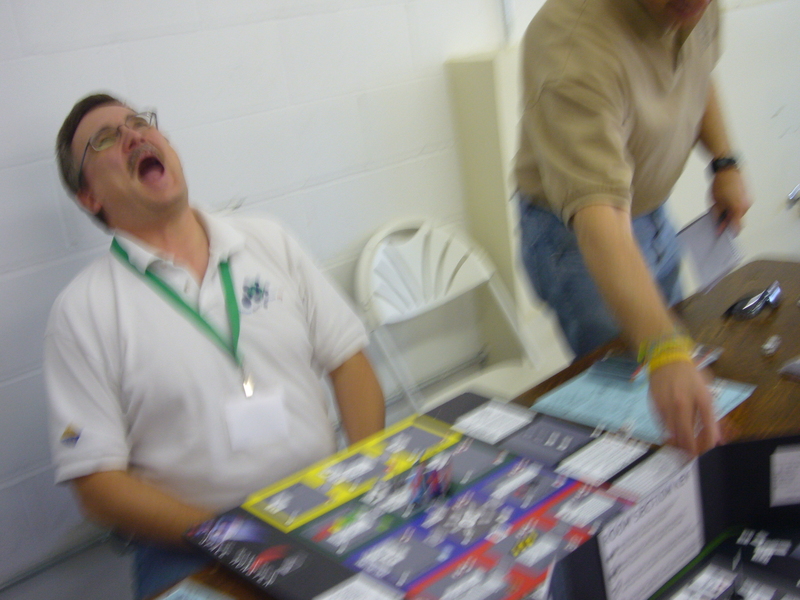 The Monster attacked and killed the panicked and defenseless Hamm, ending the game. 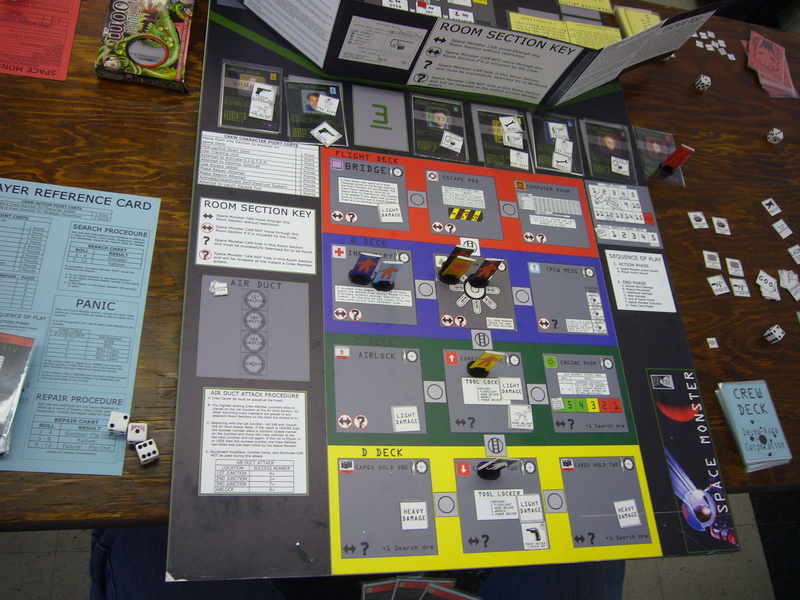 The Crew player began the game cautiously, only sending out the engineers Milton and Britt to attempt to fix the damage in Cargo Hold Two while the Captain went to the Computer Room to consult the ship’s Computer. The Monster, only at Stage Zero of it’s life cycle, spent the turn hiding from the crew and attempting several unsuccessful attempts at damaging several of the sections located on C and D deck. The majority of the Crew continued to remain in the Hibernation room constructing electrical prods to fight the monster. This strategy backfired when a door malfunction occurred (thanks to a SM Event play) and the affected room was randomly determined to be the Hibernation room – trapping 4 crew members for the rest of the turn. The Crew spent this time deciding to form into teams (Crew Event) and constructing high strength nets. Again the Space Monster spent the turn down on the lower decks, this time damaging the Engine room. Turns three and four saw the Crew start making a concerted effort to hunt down the Space Monster. They also managed to repair the Engine room. But the monster proved to be elusive and avoided detection, while continuing its attempts to damage the ship. Finally, the Monster attacked two crew members in the Engine room and killed Navigator Hamm. 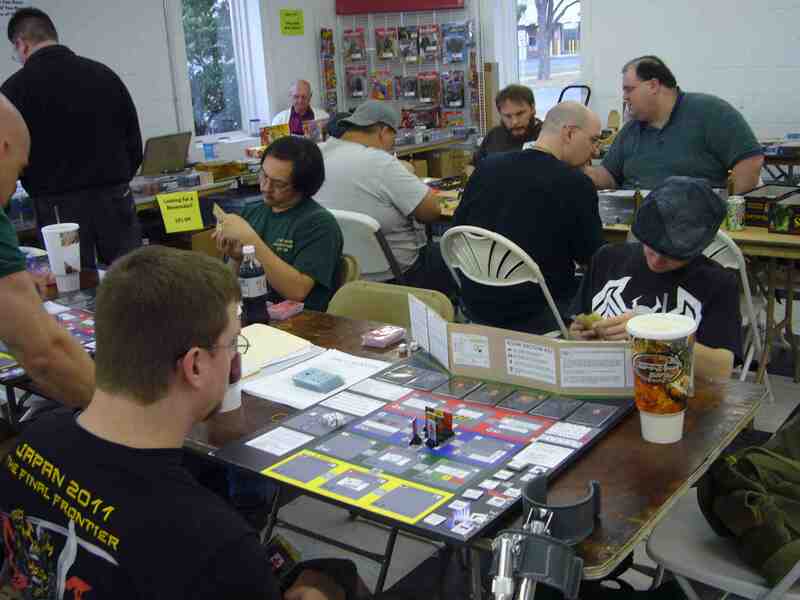 The end of turn four saw the player decks expand to 40 cards (which happens after the first death of the Crew) and the Monster evolve to stage one. The Crew spent most of turn five performing damage control – managing to keep the number of damaged compartments down to three. The monster, playing an Event card, evolved to stage 2, An ominous sign. Turn six saw the game come to a violent and bloody conclusion. The Captain, went into the air ducts in an attempt to flush out the monster (again a Crew Event), and almost succeeded, dying at the final moment. 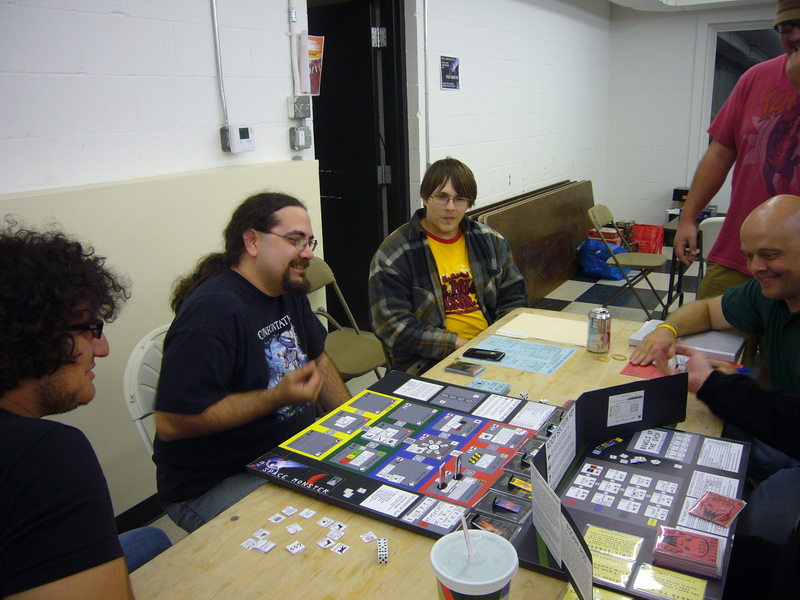 The Monster, then began attacking the Crew and in two separate attacks, wiped out the remaining five Crew members, several dying after getting hit by the monster’s toxic blood (one of the attributes the Monster player chose for this game).